Living in Edinburgh, I have the pleasure of witnessing the changing seasons all year round. I find it impossible to ever look at this wonderful city of mine and ever see it as anything less than beautiful. Although I may be bias, it's true. 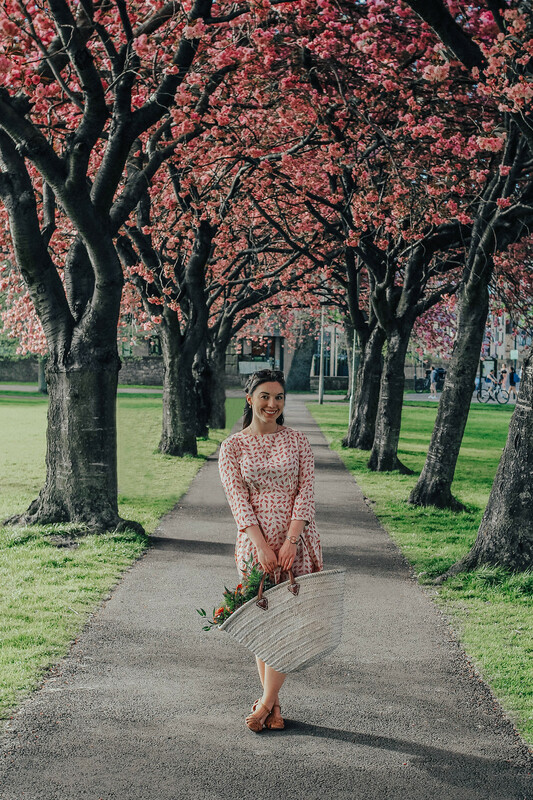 There's a certain charm about Edinburgh that's captured all year round, yet there's no season I love more than the freshness of spring when the blossom trees come into bloom. 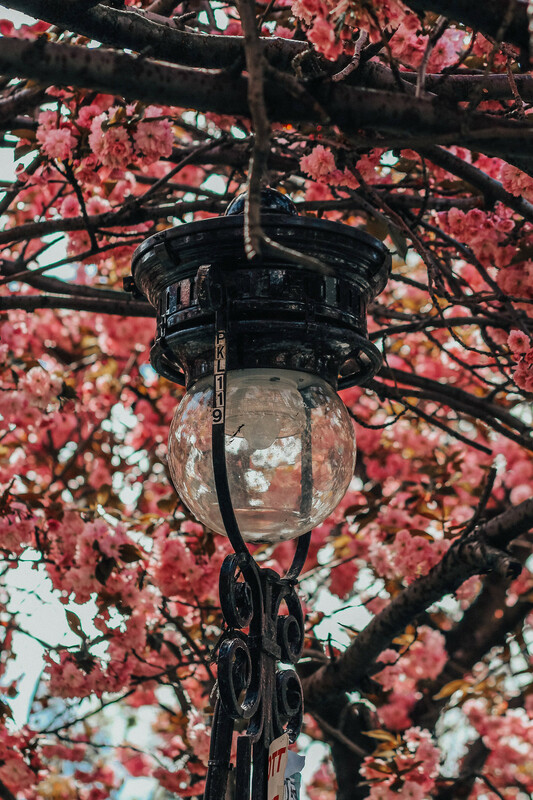 Captivated by both locals and tourists alike, the blossom trees come to life all across the city in the most beautiful ways. I'm here to tell you just where you can expect to find them, both in plain view and the hidden gems. After all, don't you know it's impossible to walk past a blossom tree without taking an Instagram of it first? Perhaps one of the most visited places in Edinburgh, Princes Street Gardens will most likely be on your list of where to visit. Offering fabulous views looking up to the Castle, providing an oasis right in the heart of the city centre. The blossom trees here line the entire stretch of the gardens hanging over onto Princes Street. Grab yourself a seat on one of the many benches against the railings here whilst the blossom drapes over you. 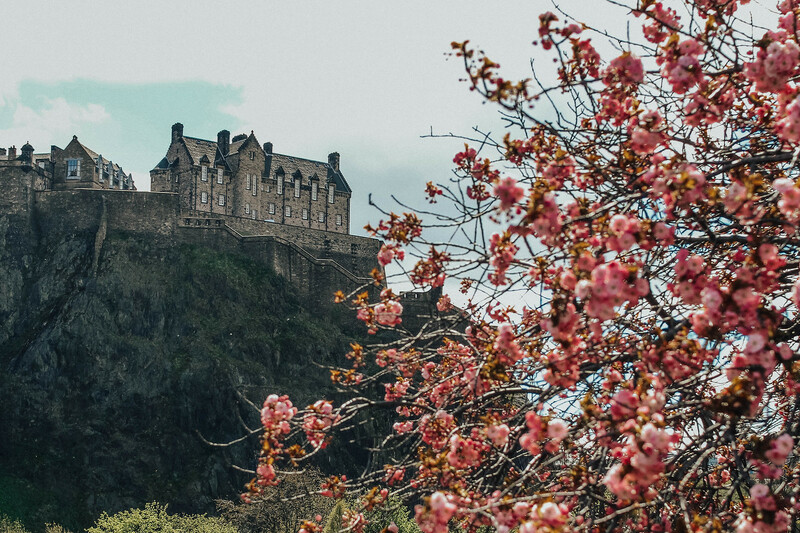 Through the blossom you'll also get that perfect photo opportunity of Edinburgh Castle. A short distance from Princes Street gardens, St Andrews Square has undergone major development lately, home to occupants including the likes of The Ivy On The Square and Multrees Walk. In the middle of the square is a community public garden and event space used all year round. 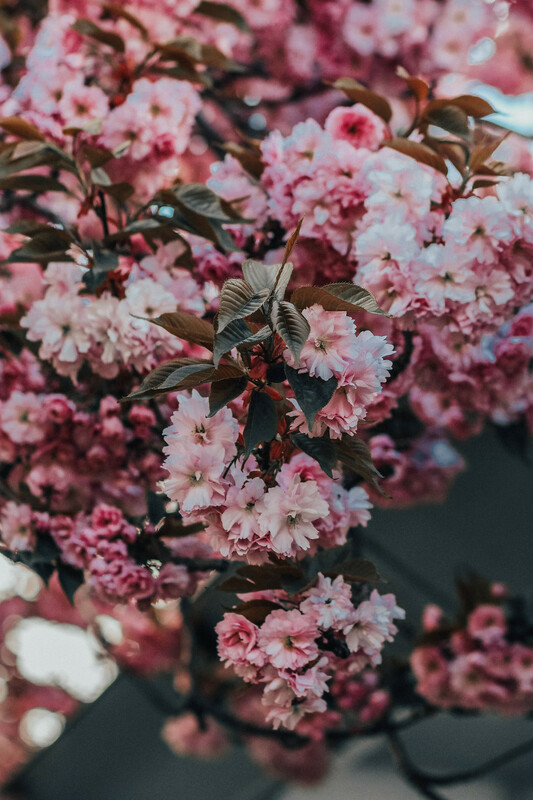 Surrounding the gardens you'll find plenty of draping blossom trees, perfect for sitting under and sheltering from the sun with a good book for the afternoon. One of the most popular hotspots in the city for a sunny day, The Meadows can frequently found hosting a hive of activity. From family picnics, to sporting events and BBQs with friends. The Meadows is a huge open green space in the centre of the city offering brilliant views out to Arthur's Seat and Edinburgh Castle in the distance. 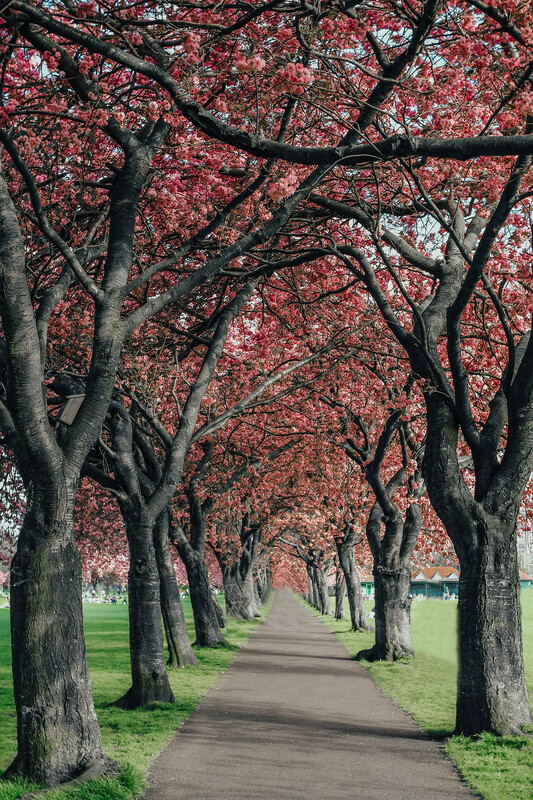 Adorned by rows of blossom trees, Meadow Walk is where you'll get that shot. 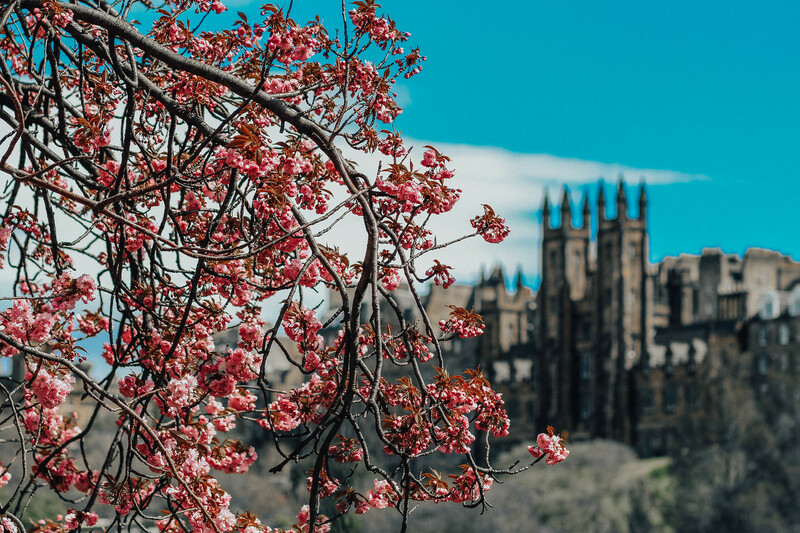 Just a short distance from the city centre, Edinburgh's Royal Botanical Gardens are home to flowers in bloom all season round; but it's spring when everything really comes to life in the gardens. 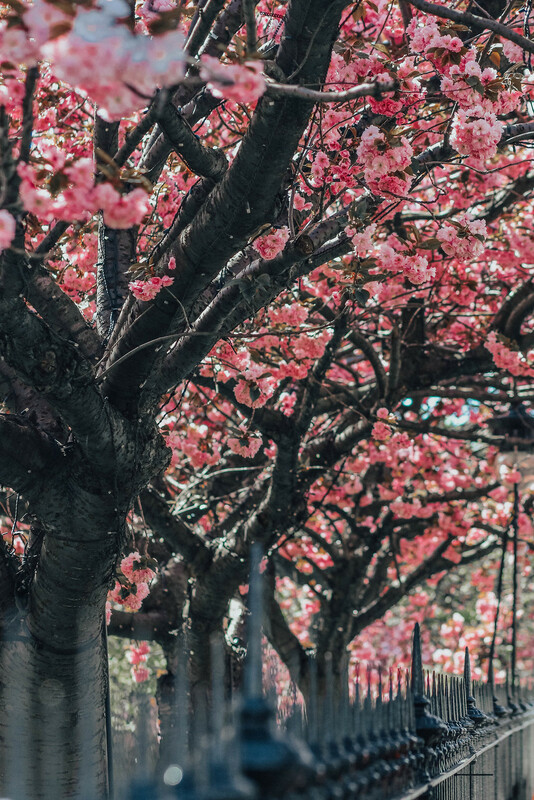 You'll find a whole range of different kinds of blossom trees here from around the world. Not to mention, the Royal Botanical Gardens are free to enter and are encouraged to be enjoyed by all. A graveyard is perhaps one of the more unlikely places you'd expect to go looking for blossom trees, however here in Greyfriars Kirkyard you'll find just that. 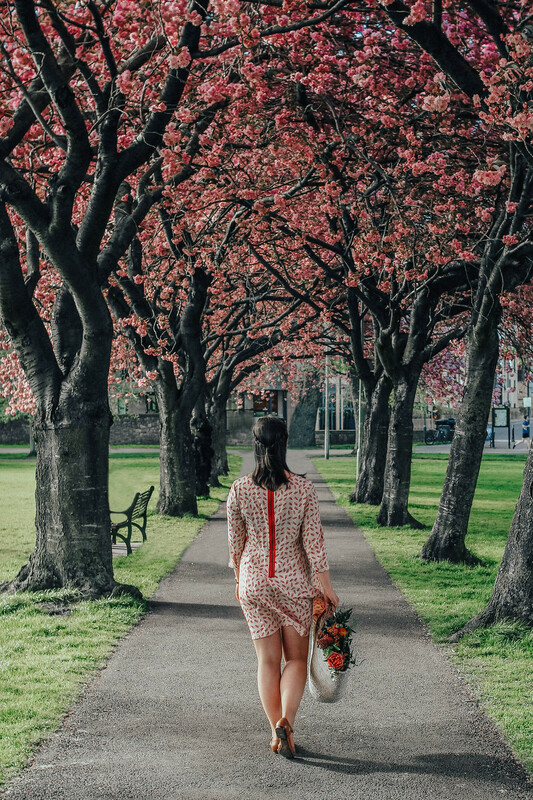 Set amongst the gravestones with a backdrop of the city skyline and Greyfriars Kirk, the blossoms here have a sense of silence to be enjoyed. I wonder if Greyfriars Bobby was a fan? The village of Cramond is one of my favourite places in Edinburgh. A short distance from the city centre, it's the perfect spot to escape for an afternoon. In the village you'll find blossom trees set amongst the stone houses and cobbled streets, making for postcard perfect scene. A little locals secret, tucked away from the hustle and bustle of Princes Street, you'll find The Cafe Royal Bar. Although you may be reading this and thinking, what does a bar have to do with blossoms? It's outside that's the real hidden gem. Here there's a perfectly placed blossom tree overhanging an old police box (or, Tardis if you'd rather!). It's currently in need of a little TLC, but hopefully by next years blossom season it'll be back in business for that perfect photo opportunity. One of the most luxurious streets in Edinburgh, Ann Street is home to some of the cities most beautiful houses. What's more perfect than a pretty Georgian townhouse? Oh just the blossom trees that adorn the whole street. This place is crying out for a blogger photoshoot just waiting to happen! The urban village of Stockbridge is where you'll find me most weekends. As somewhere I recommend more than anywhere else in Edinburgh, Stockbridge is made even more beautiful when the blossoms are out. You'll find them draping over the stone walls of houses along the side streets, or even on the market square on a busy weekend. Living in Edinburgh's West End, Harrison Park is a lovely community home to wide open green spaces. Harrison Park itself is home to several large blossom trees, leading all the way to the Union Canal and along the water. Hire a canoe for the afternoon and sail along the canal under the blossom trees. Will you be in search of blossoms this spring?